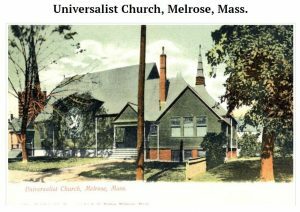 Did you know that Hosea Ballou (1771-1852), an itinerant Universalist minister from Vermont, preached at Melrose Universalist Church in the early 1800’s? One of the influential theological thinkers of his day, he published the Universalist Magazine, in which he engaged in multiple controversies and wrote “defenses against the calumnies of the orthodox Congregationalists, Unitarians, Methodists, and other opponents….”. Originally buried on Boston Common, Hosea Ballou became an itinerant corpse when he was moved to Mt. Auburn Cemetery, where the monument pictured stands today. To learn more, sign up at Coffee Hour (starting 4/21/19), or send email to [email protected].